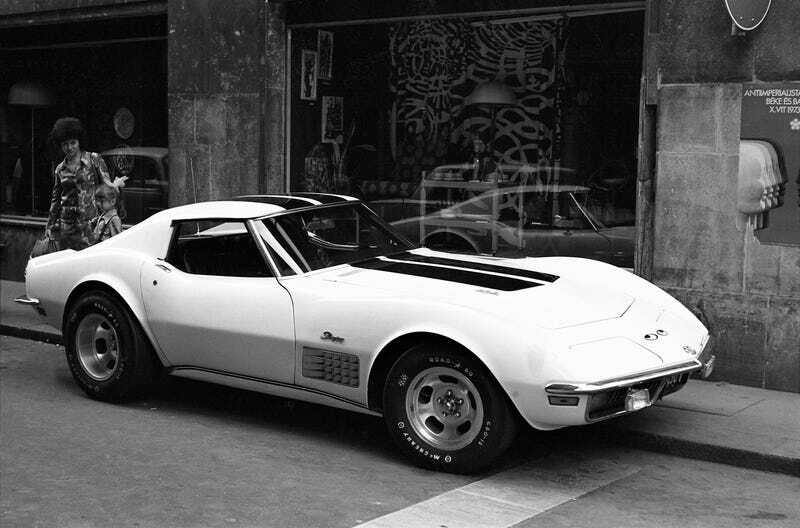 The year is 1973, the place is Budapest, the man in power in Moscow is Leonid Brezhnev, and the car casually parked on the street is a white Chevrolet Corvette C3 showing googly eyes and the stripes of freedom. While America’s flag had 50 white stars since 1960, Hungary’s was littered with red ones by the Soviets all the way up until 1989. And thanks to the limited car options at the time, that person must have been visiting town in a Corvette. There’s a lot to like about this picture. The STP sticker and those googly Moon eyes on the nose, the white lettering on those McCreary Road Star tires, the stripes, the woman who probably has never seen a Corvette before. But perhaps the best detail is that poster on the wall. X. VIT 1973. “For the anti-imperialist solidarity, piece and friendship”. As in the tenth World Festival of Youth and Students, a tool of Communist propaganda, held in East Berlin in 1973. It must have been a blast.